Our bones tend to get weaker as we age. For most, this does not result in any significant impairment or morbidity. However, in some, this weakened bone can collapse on itself and result in a vertebral compression fracture. Compression fractures can result from significant trauma such as a motor vehicle collision or, particularly in the elderly, they can occur with very minimal trauma such as lifting up a basket of laundry. The pain is typically sudden and severe. Most commonly, the diagnosis is made with a conventional X-Ray, but at times, advanced imaging such as a CAT scan, an MRI or a bone scan may be needed. Initial treatment is generally nonoperative, and includes rest, pain medications, and bracing. However, in patients that are unable to tolerate bracing or medications, or in patients that continue to have pain, a kyphoplasty procedure can be an excellent minimally-invasive surgical option. 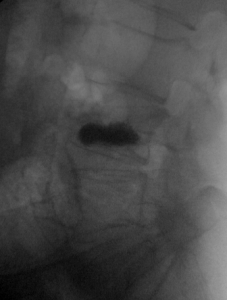 In a kyphoplasty, two small balloons are inserted into the fractured vertebral body, and are then inflated. 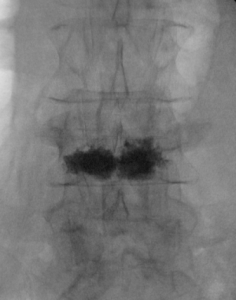 This helps restore the normal, anatomic height of the collapsed vertebral body. The balloons are then deflated and removed, and a special bone cement is used to fill the void that was created by the previously placed balloons. The surgery typically takes 30 minutes, and patients are able to be discharged home the same day without restrictions. If surgery were ultimately decided upon, our board-certified spine specialist at Guilford Orthopaedic and Sports Medicine Center, Dr. Mark Dumonski, will discuss in detail the specifics of the surgery, as well as the associated risks, alternatives, and the expected recovery time. Questions are always encouraged, and if additional questions were to arise after your office visit, please call the office. A return call from either Dr. Dumonski, his physician assistant Kayla, or one of his medical assistants can be expected within 24 hours of your call. Read more on Osteoporosis and Compression Fractures by clicking here.